Does this color look familiar??? It totally goes with the projects we did yesterday...how funny is that?!! Although I really like the color combo, I drew a complete blank as to how my layout was gonna be! I started piddling around and this is my end result in less than 30 minutes....not my most stellar moment to me!! I'm working on another card as I post this and I'm lovin' that one much more so don't abandon me LOL!!! 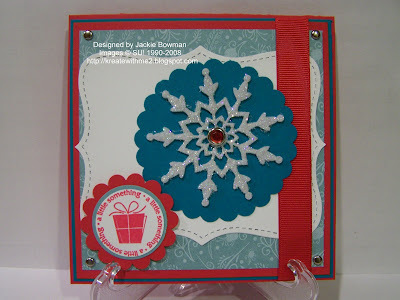 This is a great layout and I love the big, beautiful snowflake!!! AWESOME, Jackie!! !